The Electro-Harmonix Blackfinger Compressor pedal uses two 12AX7 for genuine tube-based compression and sustain. For most purists, tube-based compression offers more natural sounding and warm tones than digital options. 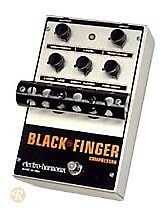 Electro-Harmonix did produce a version of the Black finger in the '70s, but without nearly as many features as the modern version.